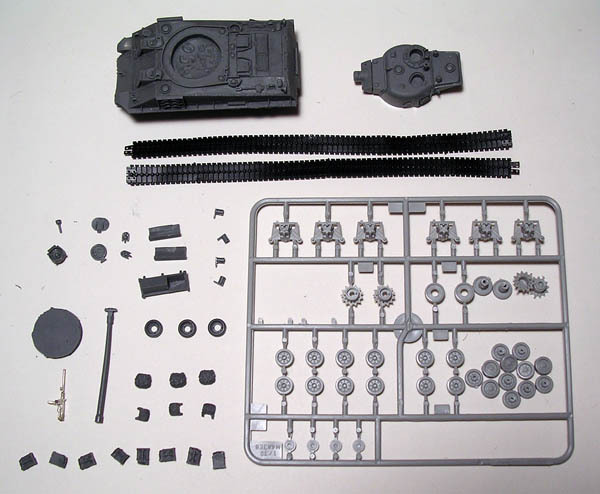 The first picture shows the layout of the parts (Trumpeter suspension parts are light grey). The Cpl. 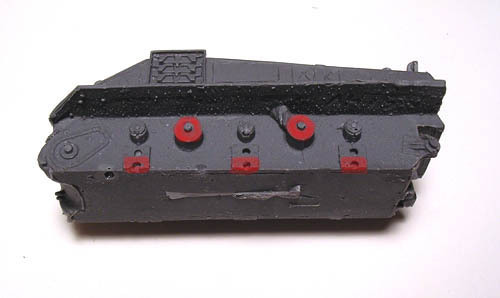 Overby parts are the hull and turret, a hull MG, a searchlight, two turret hatches, two hull lamps, two side stowage boxes, four smoke dischargers, a rear stowage bin, a turret-mounted MG (in white metal), a round plate for the turret, the gun, three spare wheels, three large stowage bags, three small bags, eight gas cans, and a partridge in a pear tree! The vinyl tracks are also Trumpeter. Note that the gun has a bit of curvature in it. This is a common problem with resin kits, but can be fixed by heating the part, bending it straight, then cooling it. I will need to modify the hull a bit to accept the Trumpeter parts. I'll trim the areas shaded in red, which are the locator pins for the large return rollers, and the attachment areas for the HVSS units. Well, so far so good. I've modified the hull and completed most of the hull and turret assembly. Got the gun straight, all the stowage applied, and the return rollers, drive sprockets, and idlers. No real problems yet. I did need to find some photos to see how the smoke dischargers are arranged. Here the Trumpeter parts are superglued into place, and the first stages of the paintjob have been applied. 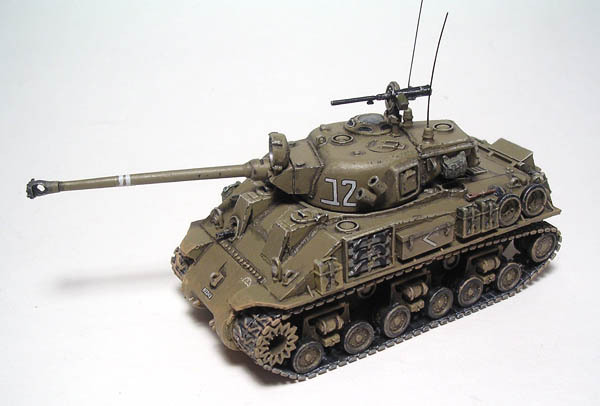 I'm using Testors Model Masters "Israeli Armor Sand Grey". Historically, this color was used as a compromise between the lighter Egyptian Desert areas and the darker terrain of the Golan Heights that bordered Israel. I'm also filling in some of the air bubbles (another common flaw in resin kits) with putty, and you can see some of the applied white putty on the lower hull front. This is the final kit with the tracks added, some antennae attached, cannibalized decals applied, and all the details and weathering painted. I'm happy with this kit! In retrospect, I might have hollowed out the smoke dischargers, as the tubes look a bit thick. 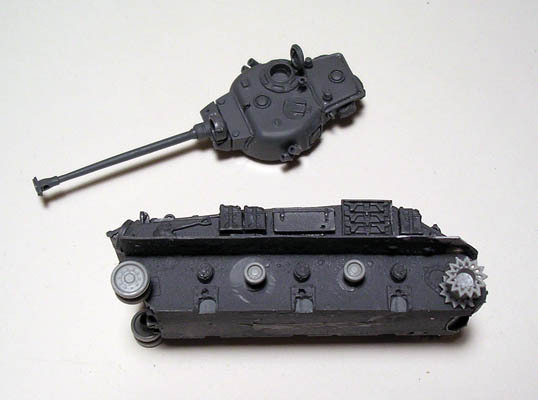 I might also adjust the Trumpeter kit return rollers and pull them out a bit, because they kinda bump into the tracks' guide teeth. Overall, a nice representation of the M50. Casting is really good with some nice detail on the smaller parts. All the included stowage is a nice touch. 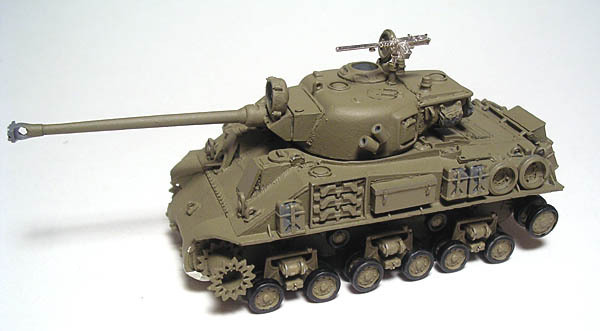 This article shared with Patrick Storto's 1/72 & 1/76 Scale Model Armored Fighting Vehicle Museum, with permission of the author and owner.